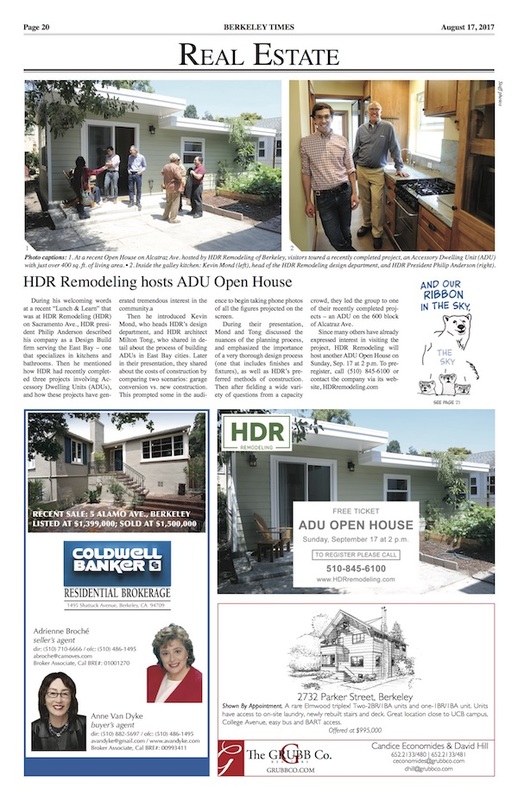 HDR Remodeling is proud to be at the forefront of constructing ADU buildings and will continue to offer seminars to homeowners on what they need to know to about having a backyard cottage built. During his welcoming words at a recent “Lunch & Learn” that was at HDR Remodeling (HDR) on Sacramento Ave., HDR president Philip Anderson described his company as a Design Build firm serving the East Bay – one that specializes in kitchens and bathrooms. He mentioned how HDR had recently completed three projects involving Accessory Dwelling Units (ADUs), and how these projects have generated tremendous interest in the community. Then he introduced Kevin Mond, who heads HDR’s design department, and HDR architect Milton Tong, who shared in detail about the process of building ADUs in East Bay cities. Later in their presentation, they presented the costs of construction by comparing two scenarios: garage conversion vs. new construction. This prompted some in the audience to begin taking phone photos of all the figures projected on the screen. During their presentation, Mond and Tong discussed the nuances of the planning process, and emphasized the importance of a very thorough design process (one that includes finishes and fixtures), as well as HDR’s preferred methods of construction. Then after fielding a wide variety of questions from a capacity crowd, they led the group to one of their recently completed projects – an ADU on the 600 block of Alcatraz Ave.